One of the great things about shelving game projects is that you get to pick up on a fairly advanced development when you’ve cleared your head of the previous project. When I made Galactians 2 I tried a few new things and generally speaking I’m thrilled with the results. So as I always do I gave myself a week or two to wind down from it before I look for my next project. I have 3 games on the shelf just now. A Defender-like Star Wars themed game, a pseudo 3D mutant shooter and an Atari Stealth-like flying/shooting game. It’s the Star Wars game that I’ve picked up to complete. 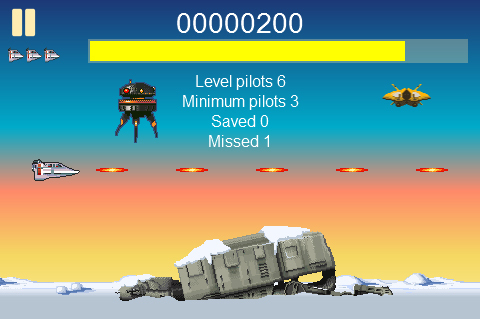 I made a similar desktop game about 2 years ago called Hoth Strike. I absolutely loved making that game. The graphics were a great challenge as were many aspects of the game mechanics. As a complete Defender nerd it was a huge thrill to create something that was essentially a big nod to it. When I completed the game I was so thrilled with it that I sent an email to Eugene Jarvis (the creator of Defender) to get his feedback. I got a simple response, “that’s a pretty hard game”. I felt completely satisfied with that response since anyone who has ever played Defender properly with all those controls will know just how damned hard Eugene’s original game was. It was nightmarish yet utterly absorbing at the same time. For my latest mobile take on the theme, Rebel Rescue, I decided to respect the platform a little. Mobile devices are not the same as arcade machines. The controls and interface are completely different. Creating a game with complex controls on a mobile device is pretty much a sure fire way of guaranteeing nobody comes back to play your game. So I changed the theme of the game from rapid multi-directional blasting to simple one directional collect and avoid. The lasers auto-fire so adversaries can be dispatched as you’d expect. But the crux of the game is in collecting (rescuing) your fallen comrades. This is my first landscape oriented game so I’m keen to see how my control system is accepted or otherwise by the mobile gaming community. I generally set myself a basic rule of making sure that the game is playable with just one hand. The thumb ought to be enough to control player movement and everything else is a case of colliding and avoiding. The game is about 70% complete just now and I hope to finish it before the end of the month. Hello sir/madem. I want your opinion. But i think currently in worldwide desktop usage is decreased. Because of smartphones and tablets growth. Iam not interest to develop games for tablet or smartphones. So in future create desktop games is waste of time or profitable …? Give your valuable opinion. Hi, a very late reply. My apologies. I would recommend developing exclusively for mobile platforms. The market is enormous. Good luck.